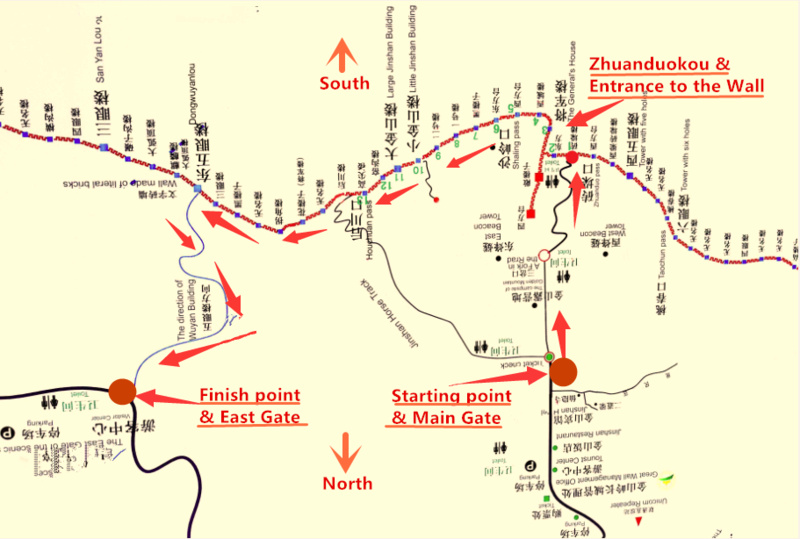 Home » Blog » How Difficult is it to Hike from Jinshanling to Simatai West (East Gate)? How Difficult is it to Hike from Jinshanling to Simatai West (East Gate)? Posted on 13/01/2013 at 05:23. If you’re looking for stunning scenery in relative isolation, combined with some exercise, then the Great Wall one day hike from Jinshanling to Simatai West is definitely for you. You will go from tower to tower until you walk to tower 22 (Simatai West / East Gate) as Simatai East is closed. 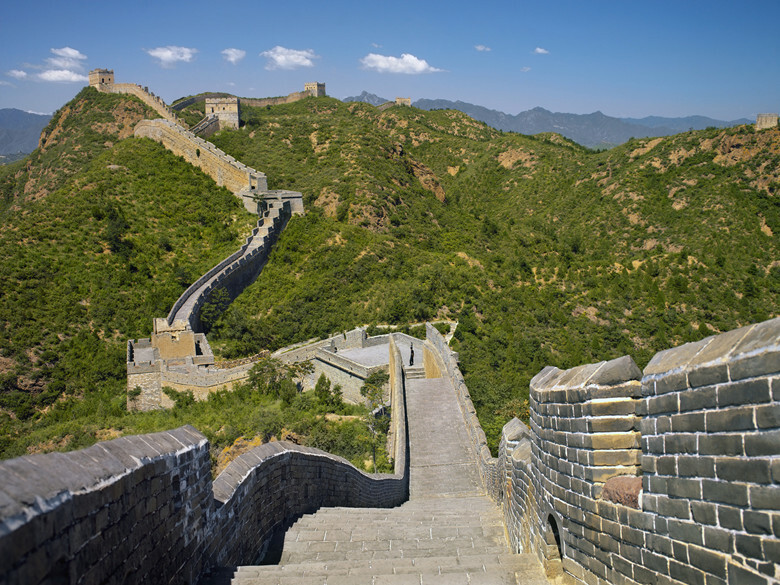 Along the way, you will enjoy the best scenery/ landscape views of the Wall. It’s worth your effort! The entire distance of your guided / self guided walk is 7-8 kilometers (4-5 miles) with a total vertical climb of around 200 meters (660 feet). The track is well formed and easy to follow but there are some places where you must walk on vertical steps, rugged terrain or through broken towers. 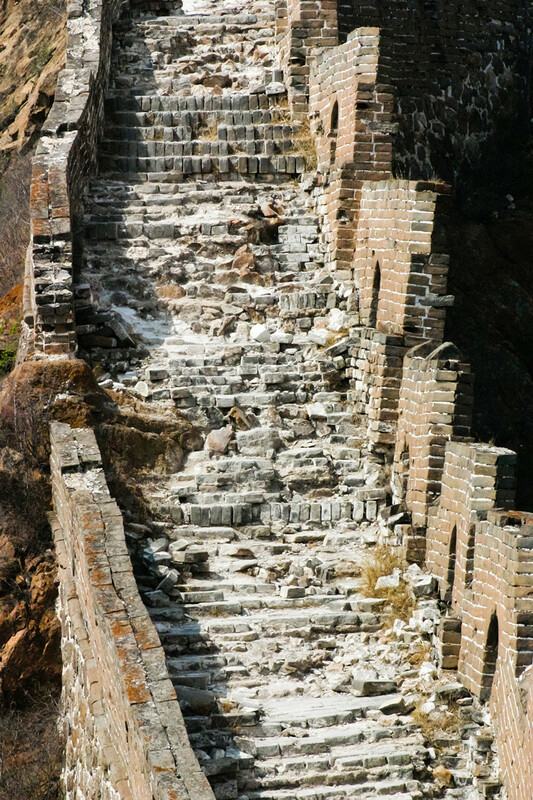 Be ready for a demanding hike as Jinshanling Great Wall has the crumbling stairs and wall– this is definitely not a stroll along a level path. Our Great Wall one day hike from Jinshanling to Simatai West is all about enjoying the amazing environment of the Great Wall. 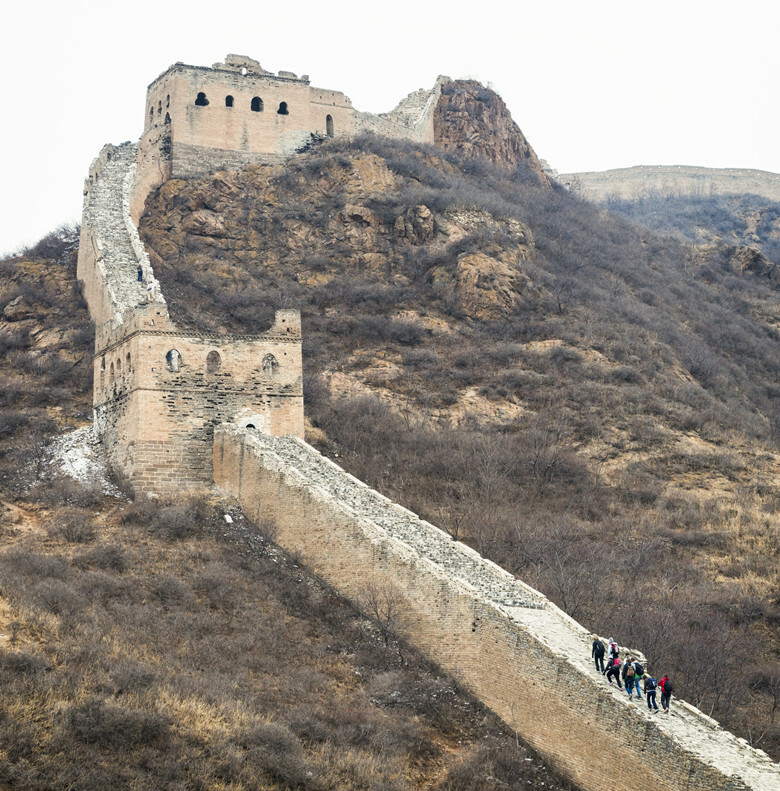 The fun and informative day trip is good for you, with stops along the way to take in the views, and take pictures while learning about Great Wall’s past. We provide walking poles and your guide will always be on hand to help you. There is NEVER any pressure to walk at a certain pace, either fast or slow. It certainly is not a race! The hike from Jinshanling to Simatai West generally takes about 3 – 5 hours. If you are seasoned hikers you shouldn’t have any problems. The fastest hikers on the Great Wall experience are the children, they are so flexible and adaptable. The adults are slower to some degree….If you are at the age of 50s, better do it in a easy pace–stop and rest a few times along the way. The wonderful view really makes your hard labor worth it. This moderate-rated one day hike requires that you be fit. Since you will not be hiking long distances, this trip is appropriate for beginners. However, in order to enjoy the trip to the fullest, you will need to be in good shape. Good walking shoes, waking poles are advisable. Take plenty of water. If you do a little walking each week, even around a city, and the idea of walking at an easy pace for 3-4 hours (with plenty of breaks along the way) does not bother you then you will be fine! If you have time then practice going up and down some hills at home so your knees are ready before your departure! However, this hike is not good for handicapped people. The wall is very steep in places but in general it isn’t especially strenuous. It usually takes me about 3.5 hours with lots of stops for pictures and resting. Do make sure you wear good hiking boots as there are parts where the surface is gone, the steps are missing, the terrain is rugged and the footing is not always reliable. If you want to just see and walk on a section of the Great Wall, this can be easily done in Badaling Great Wall or Mutianyu Great Wall. For people who agree that it’s about the journey rather than the destination, the relaxed-paced of Jinshanling to Simatai West hike is perfect. For those who want to spend a hiking-filled day away from the hustle of mainstream tourism, with the connection to nature, this is the hike they want to do. It is worth every minute and I would highly recommend the Great Wall one day hike from Jinshanling to Simatai West for you. You will be extremely satisfying to complete it although you might have sore leg muscles for a couple of days. Enjoy, and be safe. Cost: Admission fees for Jinshanling Great Wall is RMB 65 in spring, summer, fall. RMB 55 in winter. Fees can be paid at each point. Recommended time for visit: Plan your whole day around the Great Wall hike from Jinshanling to Simatai West. Leave early from Beijing, allow at least 2.5 hours to arrive at your starting point, 4-5 hours trekking time and another 2.5 hours to return to Beijing. Best time for hiking: Spring and fall will offer the best views. Summer will be very hot and winter could be dangerous due to snow and ice. Avoid to go when it is raining / snowing. Hi, a good description, but sorry, 200 meters can be the absolute vertical difference! You get it face it already if you climb from the bottom of Simatai West to the top. However, if you walk along the whole course described, you have to go down and up again several times, and that makes more than a kilometer on aggregate. That’s what is called total vertical climb – the downward climb is not counted, even so, it’s a lot more than 200 m. I didn’t try to count when I visited there, but it must be over a kilometer. Otherwise we wouldn’t need 4-5 hours to walk along 8 km’s, less than 2 would be enough. But the description is otherwise great, thanks. Hi, sorry, I couldn’t see my mistakes in the original, here’s how I wanted to write it. My boyfriend, my mother, my father and I, had planned to have some days in Beijing and we would love discover the Great Wall. I know that the Great Wall can be really crowded and luckily I heard some part are almost without not so much tourist, as Mutianyu, Jinshanling or Simatai for example. I read only good reviews about your tour, that’s why I am asking to have a tour with you. We are looking for make the tour the Saturday May 9th or Sunday 10th. We arrived in Beijing during the night between 8th and 9th, at midnight and we leave Beijing the 10th at 09:30pm. We are looking for very nice place, no so crowded, and are not afraid for walking and early wake up. We just want enjoy a lot and have a great time in Great Wall. So what can you propose us? What are your prices also? We are two students and two adults. I am asking some other agencies to be able to compare about your prices and the proposal. We also have a website, where I spoke about my trips in Asia. I can make you some advice if we go with you. 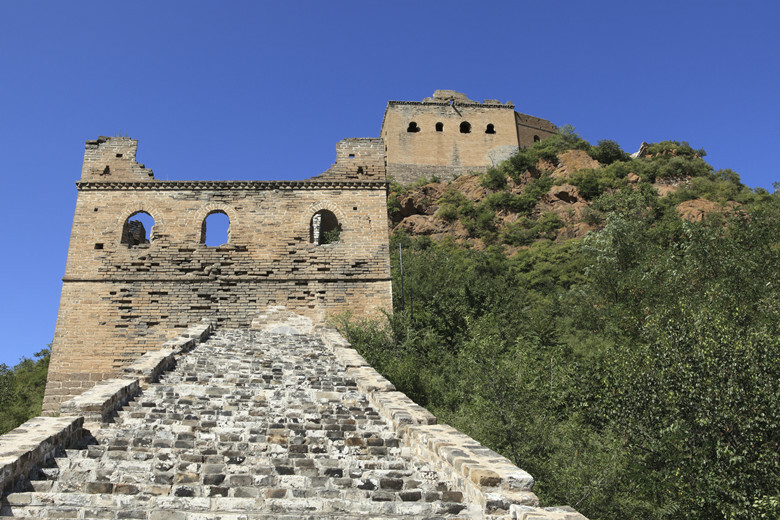 As the trail from Jinshanling to Simatai East is blocked, the original hike from Jinshanling to Simatai East can be done half way–Simatai West. You will exit at tower 22, backtrack a short distance and then descend via a newly constructed trail towards a new parking area. Still, this hike will bring you excellent Great Wall hiking experience. We’re planning doing this hike in October, but would like a less stressful evening and planning an overnight in Simatai. Is it best to grab a taxi to Simatai East and stay there? Will the eastern part be worth visiting for a day trip on the second day before we head back to Beijing? You have any suggestions about accommodation? Our Chinese is absent, but we aren’t picky at all and can stay almost everywhere. Thank you so much in advance for any help and suggestions. Is this trek recommended to be walked on at the end of December (winter time) with an 8 year old kid in tow (he likes trekking but at a moderate level)? Also wonder if this place snows and how cold would it be at the end of Dec. (We are planning to go to China between mid and end Dec 17). Hi Chle195, sorry for the late reply. Weather at Great Wall is usually like Beijing, it could be cold and dry, most of time is sunny in December. Great Wall usually snow in December or sometimes in January. Wearing winter clothes such as sweaters and a thick winter coat is highly recommended. Great Wall could be slippery due to loose snow, walking slowly could be a good option if it works for you. Is this trail recommended for trekking in late December with an 8 year old kid in tow (he likes trekking but at moderate level). Also, I wonder how cold this place can be (including chill factor) and does it usually snow at this time in December. We are planning to visit China between mid and end of December 17.